The Italian city, Brescia, was privy to the inauguration of a Metro rail service- fully automated- in the month of March in 2013. 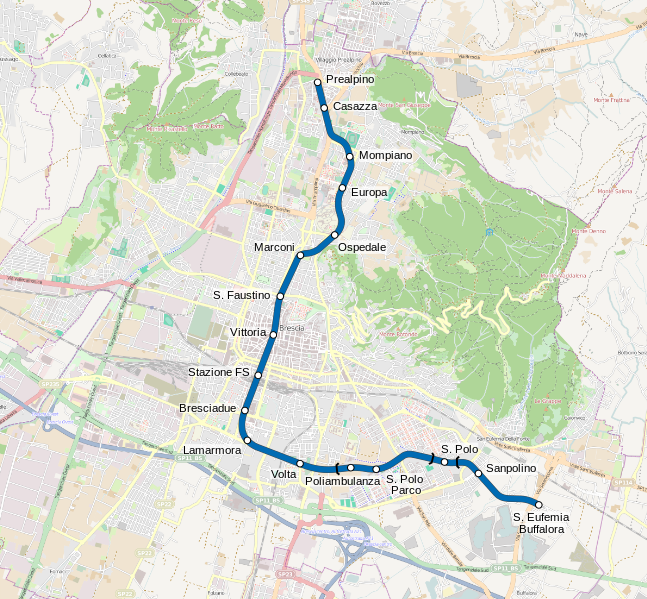 A thirteen kilometer long stretch that is operated as a driverless system connects the Eufemia Buffalora and Prealpino stations, located approximately to the southeast and north of the city. The main aim of this new Metro network in the city is to provide commuters with a train service that is not only punctual but also operates with a commendable frequency. Depending on the demand of passengers, the system has the option of either decreasing or increasing the frequency of service to suffice demands. Construction work on the project began in 2004 and was expected to be completed by 2011. However, archaeological findings at a number of the locations where stations were proposed to be setup called for further research and study of the network alignment following which redesigns had to be conducted on some of the planned stations. As a result, inauguration of the services got postponed to the year 2013. There are seventeen stations serving the current Brescia Metro network. Deep underground tunnels house eight of these stations while five of them are located just below the surface. Two stations are located at ground level while the remaining are on viaducts at sufficient heights for easy access. Owing to their close proximity to one another, commuters are quite happy to keep their cars at home and take the metro for travelling. It has a daily ridership of 40000 people. Numerous expansion plans are in place for the Metro network in a bid to ease traffic volume along some of the densely populated city streets of Brescia. The Brescia Metro has just one line which serves 17 stations. It runs from the Prealpino till the Sant’Eufemia Buffalora Station. The metro system begins operations at 5:00 am in the morning and runs until 00:00 am midnight, everyday. The frequency of the trains vary according to the time of the day. In the early hours, the frequency of the trains varies from about 8-10 minutes. However, as the day passes the frequency of trains increase and during peak hour the time interval between two trains is just 4 minutes. The fares for the tickets for the Brescia Metro system are different according to the different zones. The zone 1 tickets cost € 1.40 and are valid for a period of 90 minutes. Whereas, the zone 1+2 tickets cost €1.90 and are valid for a period of 100 minutes. Map of Brescia Metro showing its lines and stations. Click on the map to enlarge it or Download Brescia Metro Map in PDF.